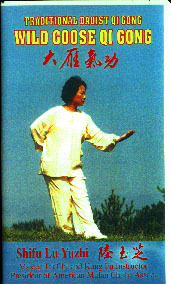 Although wild goose qigong is a huge system we found that only Dr Hu covers most of the range. Everyone else just had versions of the first and second sets. Yang Mei Jun, gives explanations in the program regarding the key points for every phase in the 128-posture routine form. Note: A pupil performs the moves. Physically the form rotates and moves all the major joints leading to increased flexibility, co-ordination and improved circulation of both qi and blood. The 2nd 64 movements covers a complex range of techniques including weight shifting - slightly different from traditional taiji weight distribution - coupled with changes of pace and emphasis in the center periphery - splitting movements. In some ways this qigong revises the basics of fluid weight shifting, core stability and balance and adds the need to co-ordinate upper and lower body movement to both the turns of the hands and the turning of the body. Tripod and spiral is unique in providing a variety of training within one set of qigong movements, ranging from postures, relaxation, stretching, the free flow of qi, and finally achieving the microcosmic orbit. Soft Palms Qigong is an intermediate skill level qigong requiring coordination and agility with a range of backward and forwards walking coordinated with the turning and softening of the wrists and palms. Simply put, you pat the 12 meridians in a set sequence while walking a Kunlun Bagua circle. 7 stretches the spine and opens the Governing Vessel using a deceptively simple Chinese figure eight movement to relax the entire waist and hips while Bagua walking. Learn the secret of how quick and linear movements can stimulate Qi to permeate to the body surface, and how soft and gentle movements can stimulate Qi to run deep to nourish internal organs. As you can see you need to buy 3 dvds to cover the first 64 movements. Wild Goose Qi Gong, By Lu Yuzhi. An initial demonstration of the entire 64-movements of the first form, followed by step-by-step teaching of groups of movements. Each movement is shown three or more times. There are front, rear and side views. At the end there is a demonstration of the form from the rear. Hong-Chao Zhang's VHS tape complements his book. The first 64 movements are shown twice. The first time has an accompanying voiceover track and divides the set into small sections. The second demonstration is continuous and has no voiceover. The pace is very gentle. 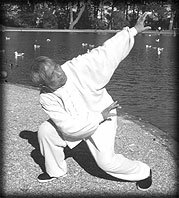 Master Lu Gui Rong is a master of Wu (Hao) taijiquan, Yang taijiquan, and Wild Goose qigong.